MosChip specializes in Netlist to GDSII generation using both Cadence and Synopsys flows. We not only maintain leading EDA infrastructure for physical design, but also employ a team with dedicated subject matter experts with rich experience in the physical design flow and methodologies critical to achieving optimum performance, power, and area. 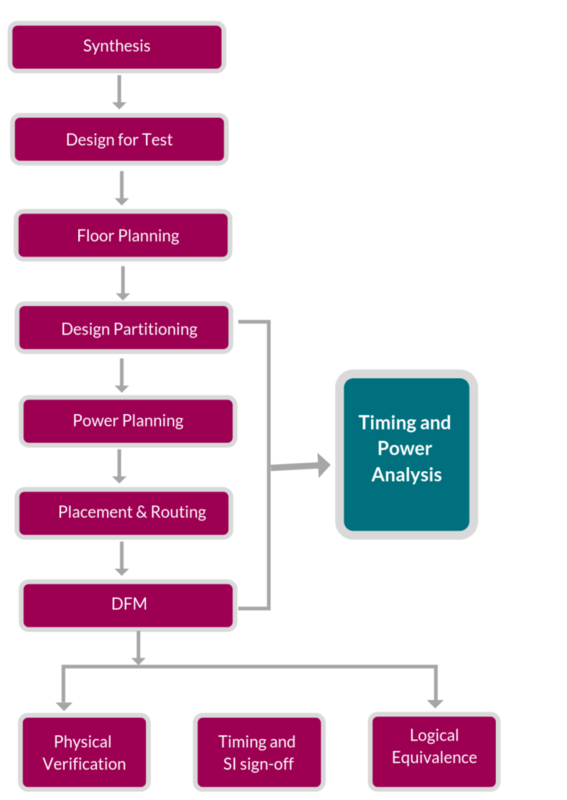 Our proven flows and methodologies ensure that the design gets through the range of foundry specific DRCs, LVS and ERCs precisely to avoid multiple iterations to avoid delays and stay on schedule. Our Verification Team compliments taking care of Netlist verification at various levels of GDSII generation including SDF annotation, and ultimately aids run Sign-off verification. We also help our customers make the choice of foundry for tape-out, which is one of the most critical aspects of the process. MosChip closely works with leading foundries including TSMC, GF etc. Over the last few decades, MosChip has been involved in Synthesis, Physical Design and Timing Closure on quite a few multi-million gate chips with frequencies running up to 1.2GHZ. MosChip has been involved in tape outs targeted to 14nm/10nm/7nm process nodes. MosChip team has experience with TSMC, Global and Samsung Foundries. MosChip has developed synthesis, physical design and timing flows that have been successfully used on a large number of designs. Team has strong expertise in implementing low power techniques – Clock Gating, Mulit-Vt, Voltage Islands, and Power Gating.